RIVIERA DOGS: A bruno de.......? This gorgeous creature looks just like my beautiful Beau, a Bruno de Jura, except this one is a different colour and her tail is docked. Go to this link to see Beau. I don't know what breed this lovely dog is. If anyone knows, do please write to me. She looks like a 'bruno,' with her 'bloodhound' sort of face - and doing an impersonation of a Thurber dog. 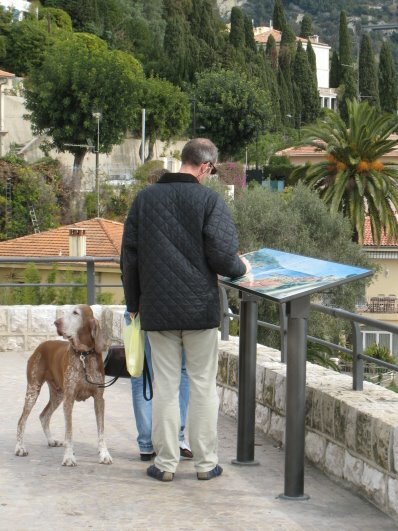 This was taken above Menton, near to the cemetery at a 'viewing place' at the beginning of the Boulevard de Garavan. 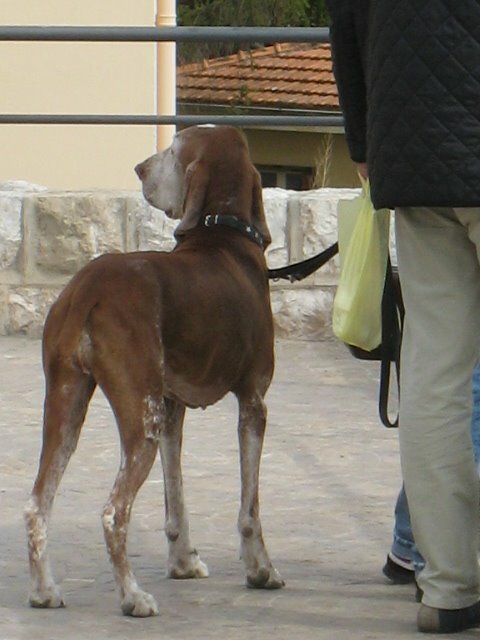 August 2007: - Thankyou to Zeljko who has told me that this dog is a Bracco Italiano. (see comment below) This beautiful dog is now correctly listed under the list of breeds on this blog. Dog on photo is Bracco italiano, very good italian hunting dog. Your blog and web site are great.I love to read James Herriot stories so I can say you are very talented writer with wonderful heart and I am sure, dogs can say the same.Hope you will write a book some day. My wife and me are going to visit Menton and Gorbino in a few days maybe we shall drink coffee in some Menton caffe. Thankyou so much for leaving this comment. As you'll see I've corrected the breed of dog - he's now properly listed - and have also written a few extra words in the main copy above. I hope you have a great time in Menton and Gorbio (please email me privately if you feel like it) - and thanks so much for your encouraging comments.